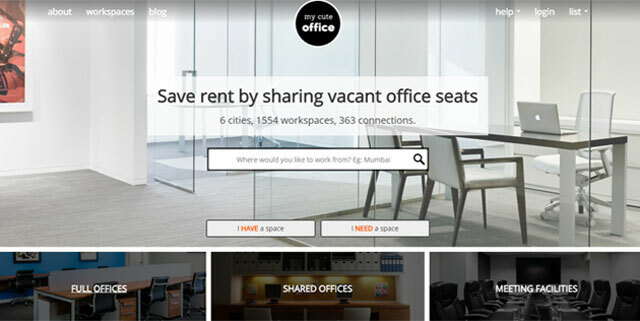 Mumbai-based on-demand platform for sharing and renting office space MyCuteOffice has raised an undisclosed amount in seed funding from Lead Angels, an angel group. "The capital raised will be mostly invested into process building and experimentation in terms of market capturing exercises," Abhishek Barari, co-founder and CEO, MyCuteOffice told Techcircle.in. MyCuteOffice is a marketplace for sharing vacant work desks, offices, studios and meeting facilities to help small businesses save on office setup and rental costs. It allows businesses to rent spaces on hourly, daily or monthly basis. Barari said the startup is looking to raise another round of funding in the range of Rs 6-9 core in three months. The firm has already been in discussions with a number of venture capital firms including IDG Ventures, Nexus Venture Partners, Helion Venture Partners, Accel Partners, and Bessemer Venture Partners for the next round of fundraising. The existing investor Lead Angels is unlikely to take part in the round. Barari said, "Our focus is on supply rather than demand. We are looking to have around 5,000-7,000 listings on our portal by this year-end, so that we can offer at last 50,000 workstations." The company plans to expand the team to 12 people by the first week of June from six currently. It plans to focus entirely on Mumbai operations until July and will expand to Bangalore and Delhi by year-end. It will also expand its services to tier-II cities after the next round of funding. Besides, the startup plans to launch a mobile app. MyCuteOffice was founded in January 2015 by Abhishek along with his friends Rahul Shelke and Neelay Jain who are CTO and COO, respectively. The startup claims it has connected over 400 space seekers to space providers in four months. "We are excited about MyCuteOffice as the market is large and disorganised and the team has the determination to grow this into a large business. Lead Angels is looking at ideas which try to solve a big problem," Sushanto Mitra, founder and CEO of Lead Angels, said. Lead Angels has chapters in Mumbai, New Delhi, Ahmedabad and Hyderabad.